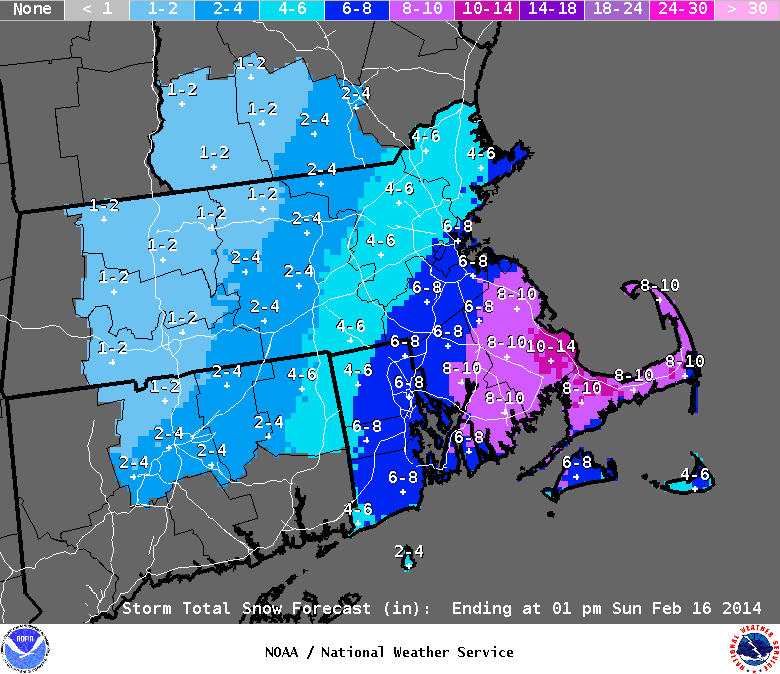 A quick moving storm will drop several inches of snow across Southern New England today. 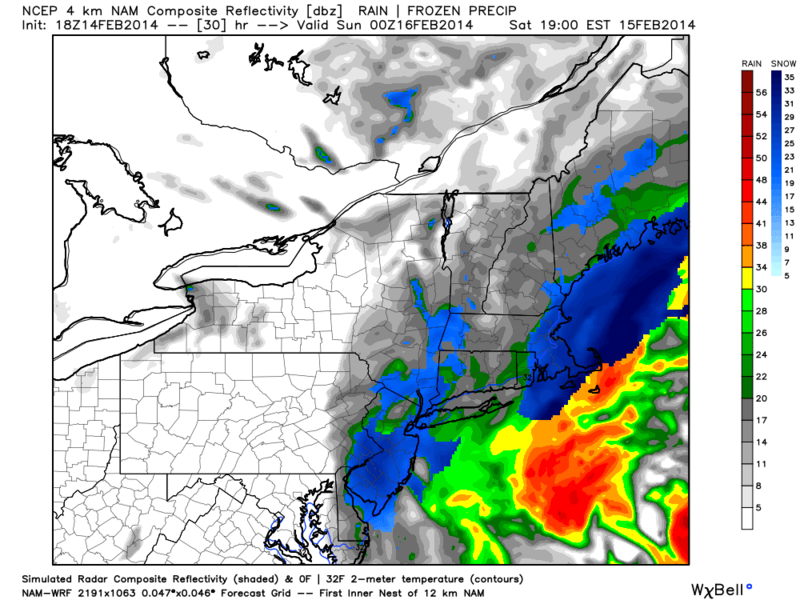 Most of the precip will fall early this afternoon and this will impact the PM commute in Eastern MA. The National Weather Service in Taunton has issued a Winter Storm Warning for parts of the region (in pink) and a Winter Weather Advisory (in blue) for others. The Cape, Islands, and SE MA are not included in the headlines as they will see mostly rain. The regional radar shows some precipitation already streaming into Western New England. A lot of this is not reaching the ground. Expect snow to begin accumulating around 7 am in W CT/MA and by 9 in Boston. It is cold in New England this AM. 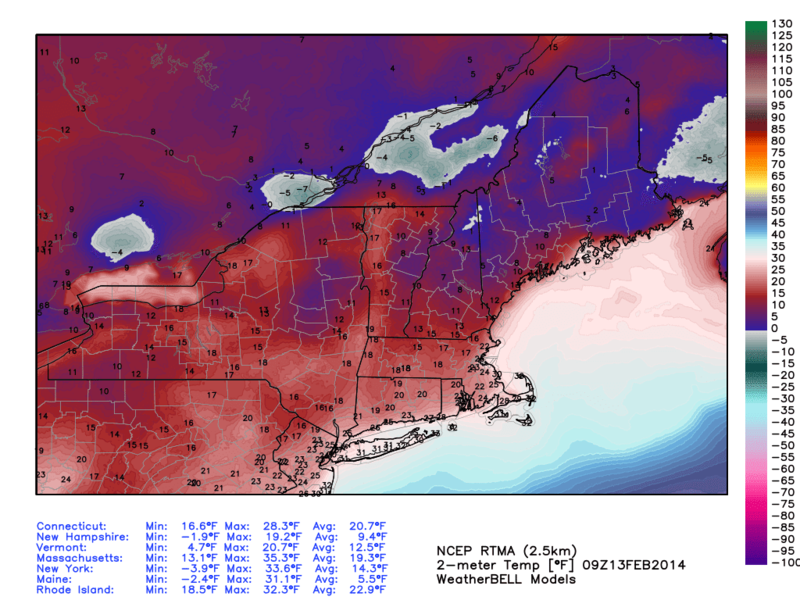 SW CT and the Outer Cape are the only ones in the 20's. This means snow will stick immediately and travel will become difficult. As the low track towards New England it will bring some low level warmth across CT/RI/SE MA. Temperatures will climb to near 32 in those areas. 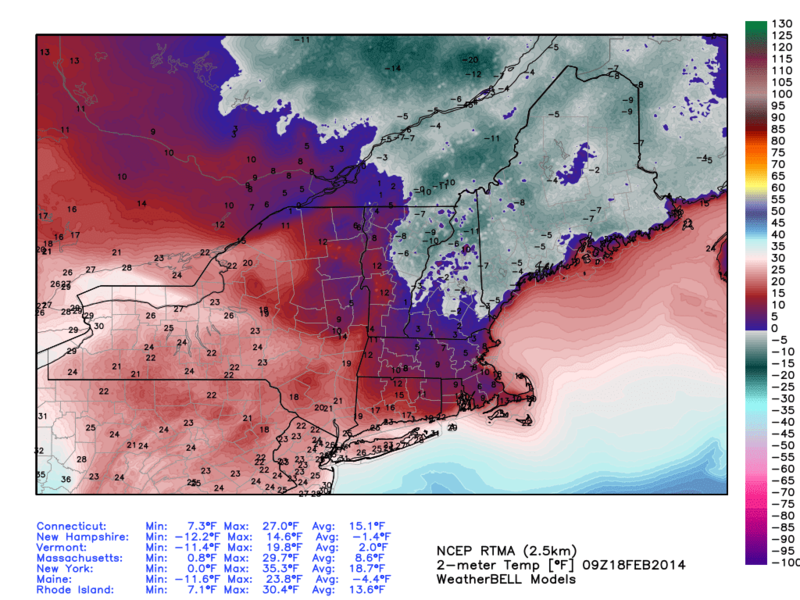 Temperatures are on track to remain in the upper 20's for the rest of MA/S NH. 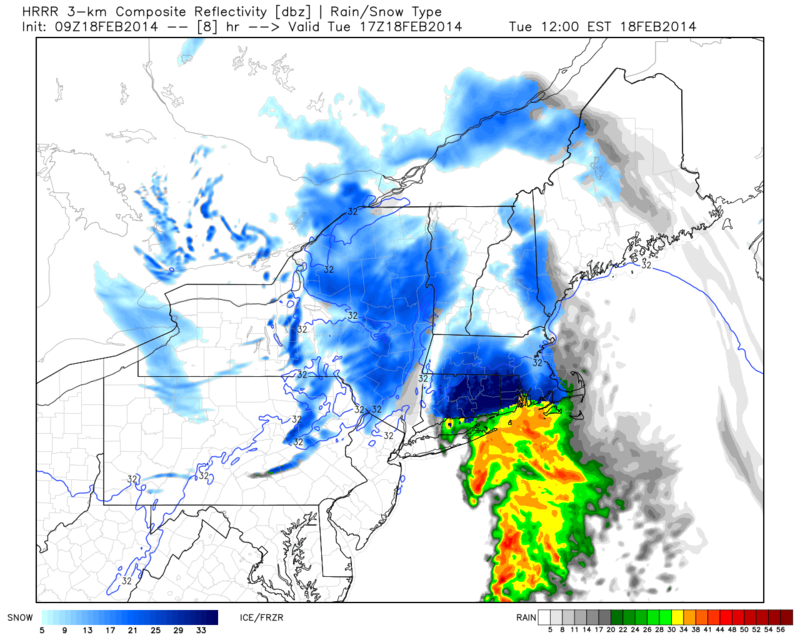 Latest HRRR (super short range/high resolution model) seems to have a good handle on the convection. 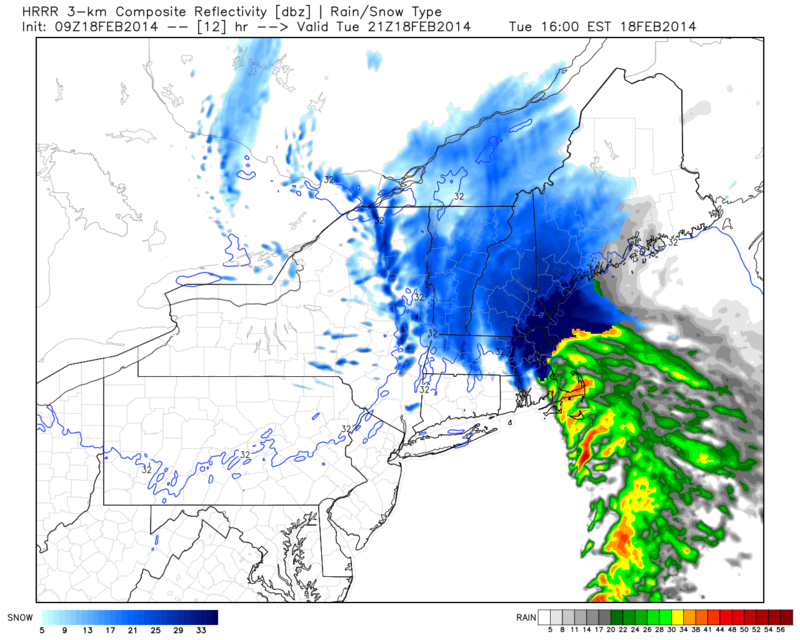 This would bring the moderate to heavy snow into CT by 10-12 PM and into MA around 12. The low deepens this PM and snow falls heavily until about 4 PM in Springfield-Worcester-Providence. Snow hangs on through the evening commute in Boston. I could see some higher amounts in the 3-6" if thundersnow is able to develop this PM. The snow will be fast & furious with any convection this afternoon. This storm is going to explode when it reaches the coast. The first phase of this winter storm is over. Nearly a foot of snow fell in Central and Western MA, Southern New Hampshire, and Eastern Connecticut. The second phase is the lull in precipitation region wide. The third and final phase will occur from 10-7 am. This will occur as the storm center moves over SE MA and moves into the Gulf of Maine. High res guidance and radar trends suggest another 0.5 inch of precipitation for most of New England and perhaps some big time snowfall accumulations in the Berkshires. This is likely rain in Eastern MA. In Worcester County I see mainly snow north of the Pike with mixed precip across Southern Worcester County. I think the Berkshires end up as the big snowfall winners from this one. Precip ends around 7 am. Good Morning. Light snow is arriving in Southern New England as of 530 am. Heavy snow, rain, sleet, ice, and wind will impact the region through early Friday morning. Winter Storm Warnings have been extended into Essex and Suffolk Counties. Wind Advisories exist for the east coast of MA from the Cape up to Gloucester. It is raining from Boston-Providence-Hartford South and East. 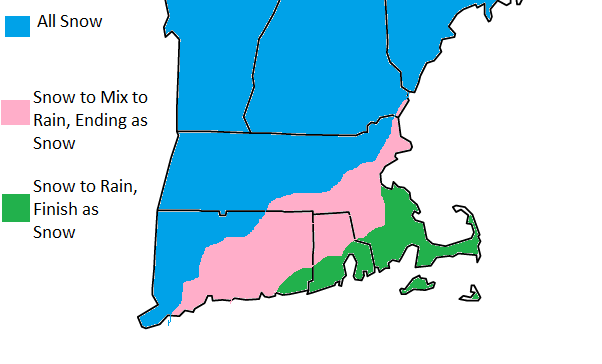 Ice will be an issue near the Pike and 495 so communities like Marlboro, Northbridge, Lowell etc will likely see 6-10 inches of heavy wet snow and then a layer of sleet/ice on top. Questions, comments, complaints can be sent to twitter @zgreenwx or facebook if we are friends. A strong winter storm will impact many in the Eastern US over the next 2-3 days. The storm is expected to track over the Cape which means many South of the pike and inside of 495 will change to rain for a period on Thursday. Heavy wet snow will fall before any changeover and this storm will pack strong winds. Here is the surface chart. 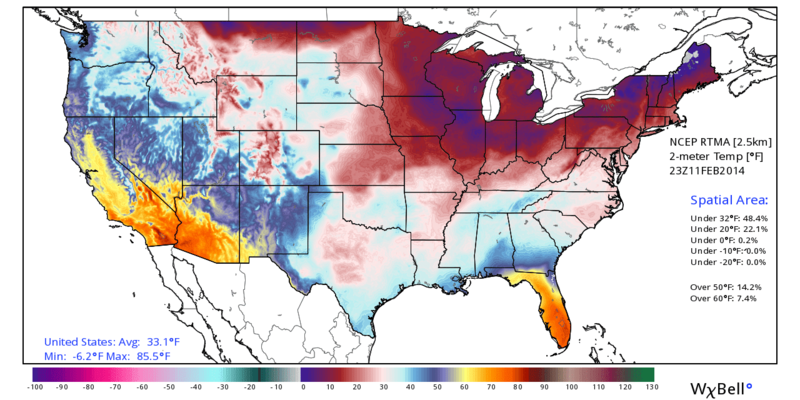 High pressure in the Great Lakes is allowing cold air to pour into the South. This sets the stage for a major Snow/Ice event in the South tonight/tomorrow. This situation is no joke for our friends down there. Ice can be paralyzing for any community, no matter how use to winter. There is plenty of juice in this system. 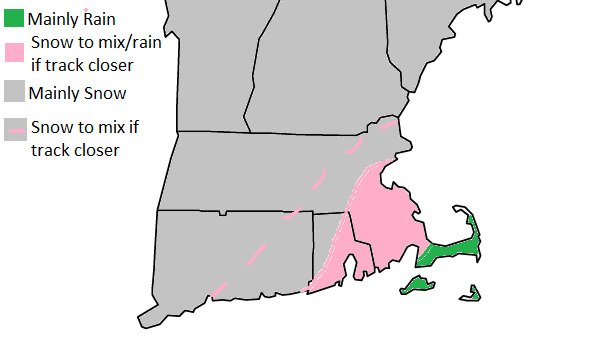 Everyone except starts with snow, even Nantucket and the Outer Cape but they will switch to rain quickly. The initial burst of snow will be substantial, much like last Wednesday. Snow breaks out around 7-9 AM and will be intense until early-mid afternoon. At this point the low will be nearing the Cape. It will draw warm air into the system and change the snow over to mix/rain. Strong winds combining with a heavy wet snow will lead to scattered power outages. 1.5-2" of precipitation will fall out of the sky so isolated street flooding is also possible. More in the AM. Are you sick of winter yet? 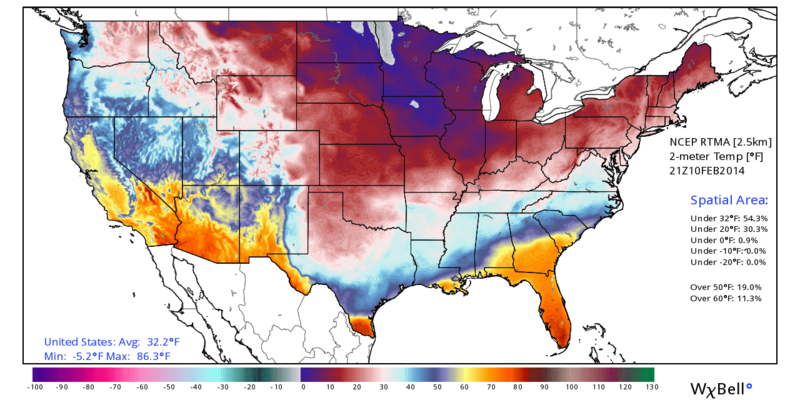 It has been a remarkable winter so far for the Eastern 2/3 of the United States. Another winter storm will impact Southern New England on Thursday. The Jet Stream splits into a Northern and Southern stream in the west. One stream is in Southern California through Arizona and New Mexico while the other enters the US in Washington. The Southern piece of energy will slide east through Arizona, New Mexico, and Texas towards the Gulf Coast while the Northern piece slides southeast through Montana, South Dakota, Nebraska, and Missouri. The Southern piece will deliver quite a blow to the South on Wednesday. This is after they get through several waves of low pressure tomorrow. Locally the weather is quiet tomorrow and Wednesday. Tuesday Cold tonight with mostly clear skies. Low temps 5-10. Mostly Sunny during the day, highs 20-25. Very cold Tuesday night, expect low temps -2 to 4 above. West wind could gust 15-20 mph so wind chills around 0 are likely. Wednesday Cold again with mostly sunny skies. Temps 20-25 with a light north wind. By Wednesday morning a healthy storm will have formed along the Gulf Coast. The Northern stream energy will not have combined with the Southern stream yet. This upper level set up favors a deepening area of low pressure moving just South and East of the Cape/Islands. 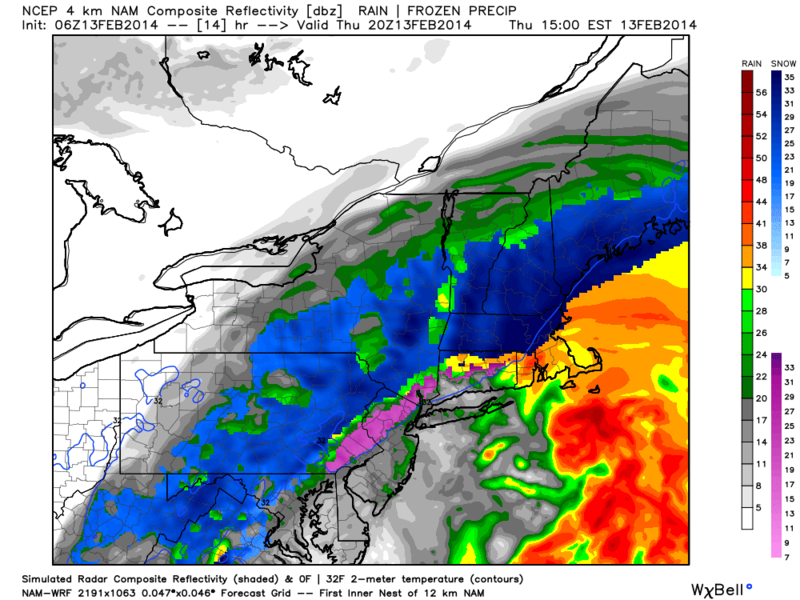 A lot of precipitation will fall with this system and strong winds will move across Southeastern New England. 60 hours out is too far for me to make a map. 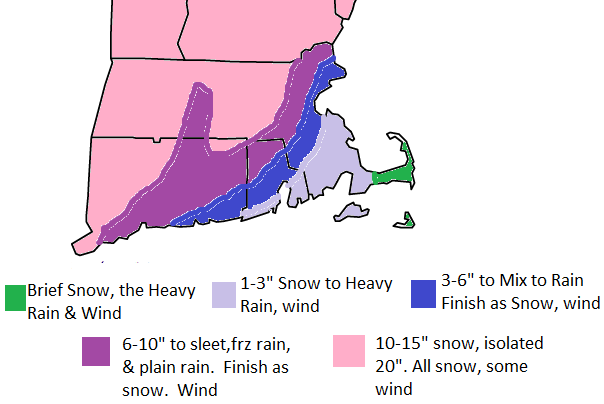 I am confident in heavy precipitation and at least 3-6 inches of snow for most outside of 95. I'm also confident in strong winds gusting to 60 mph in Southeastern MA/Cape and Islands. 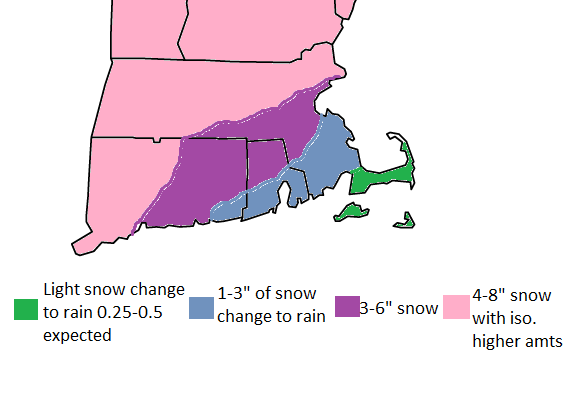 Where the rain/snow line sets up is a tough call. There is no high pressure to the north to lock the cold in. However there is a deep snow pack and the Atlantic is about as cool as it can get around here. The storm looks to start around 7 am on Thursday. The morning looks to be all snow for everyone except the Outer Cape and Nantucket. The storm will wind down early Friday morning. I'll have the accumulation map tomorrow. Have a good one.